Every week I get a CSA (community supported agriculture) box delivered to my door. It’s kind of a splurge, but I can’t tell you how much fun it is to open up that box come Monday morning when it arrives on my doorstep! Another thing I love about receiving the CSA box is that it pushes me to try different vegetables and also to eat seasonally. The problem with seasonal vegetables around here is that for about 6 months of the year, you’re stuck with root vegetables. But now spring is here, and this week’s box had a gorgeous bunch of green beans. Squee! I knew I wanted to use them in a way that let their freshness shine through. And that’s how this salad was born. 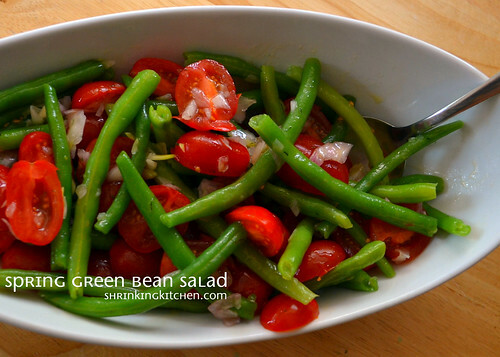 This green bean salad is so delicious, so fresh and I love the COLORS! And of course, I love the simplicity. Just a few ingredients and you’ve got a bright, super healthy (packed with vitamin C) side dish. I served mine with a piece of broiled tilapia. Prep green beans (snip off ends and wash). Parboil beans in salted water till tender-crisp, about three minutes. Drain beans and immediately plunge into icy cold water to stop the cooking process. Drain and dry green beans. Add shallot, salt and pepper to the bottom of a large bowl. Using the back of a wooden spoon, mash and grind the shallot, salt and pepper together into a rough paste. Whisk in vinegar first, then olive oil until the mixture emulsifies. Throw in the green beans and tomatoes, and toss gently to coat with dressing.